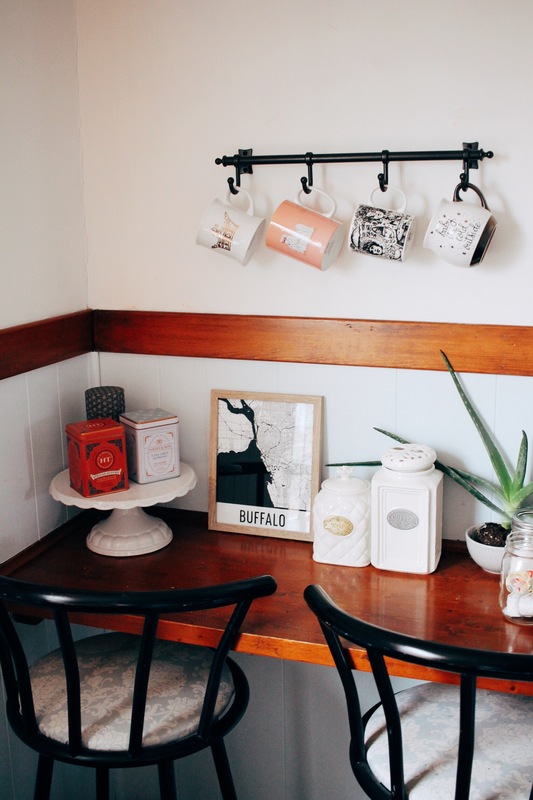 We all have our favorite little spots in our homes. In my family’s house, I loved sitting on our side porch and sitting in a chair in the corner of our living room. We always have spots that are our favorites this little kitchen nook one of my favorite parts of my apartment. It was one of the things that struck me most when we first saw our apartment. 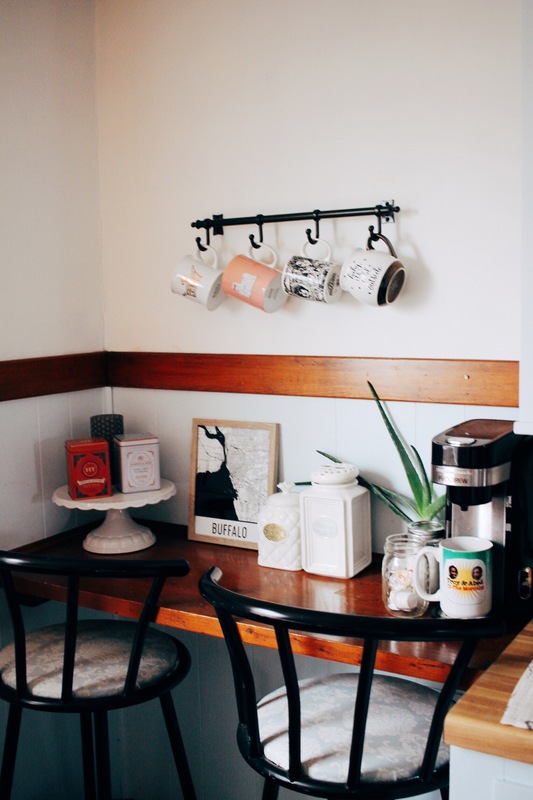 I thought it was a really cool part of the kitchen and would make the perfect coffee bar! Then, when I found those bar chairs on the side of the road, I decided to salvage them for this nook. I reupholstered the seats and bought a matching bar for the mugs and it all came together. 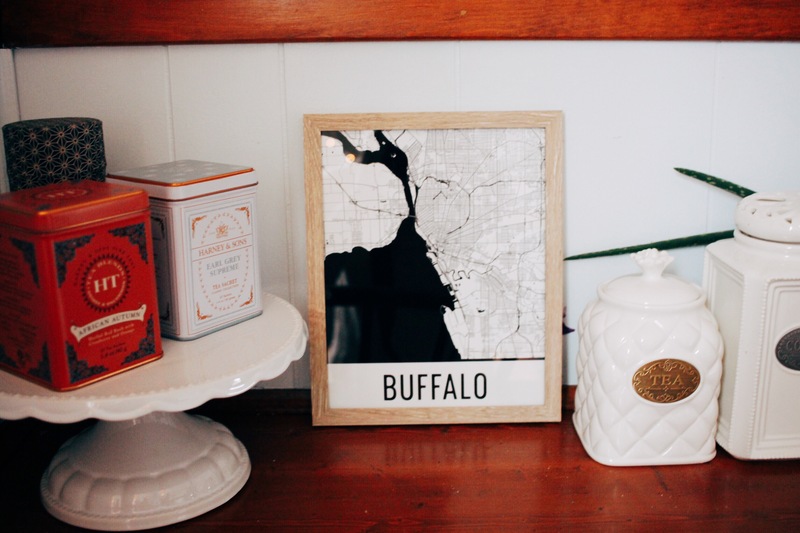 When Modern Map Art sent me about this Buffalo print, I knew just where to put it. Not only do frames look good on walls, but they also look really good just propped up on a shelf. So, I put my beautiful print of Buffalo here and I’m really happy with how it looks! 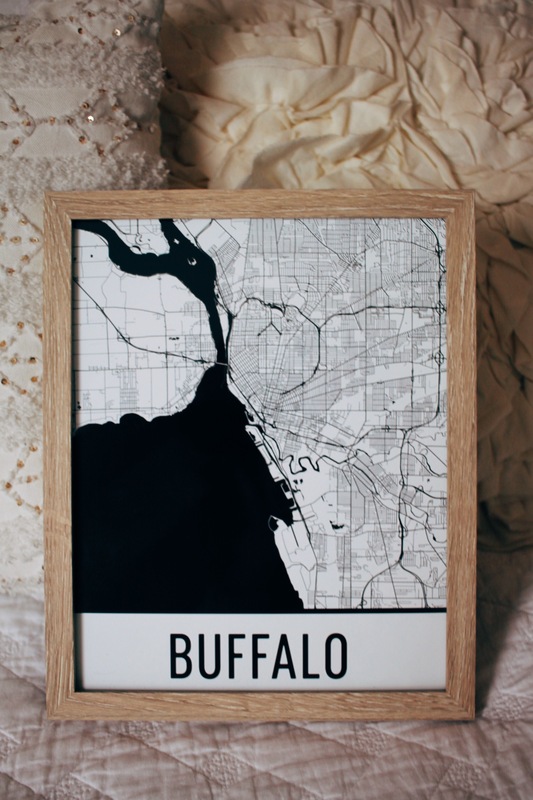 They have over 600 prints of different cities around the world, and I’m happy Buffalo is one of them! Do any of you have a favorite part of your home? That is such a cute little space! How awesome that you were able to salvage those stools, the seats look great. In the winter, my favorite space in my home is snuggled up on the couch close to the fire. It’s the warmest, and thus best, spot. Thanks Kathryn! If I had a fireplace, I’m sure that would be my favorite place too! Someday I definitely want to have one, they seem so worth it. I love the mugs on the wall. Definitely looks like a cozy and nice spot to spend your time at. Your home is so chic babe! 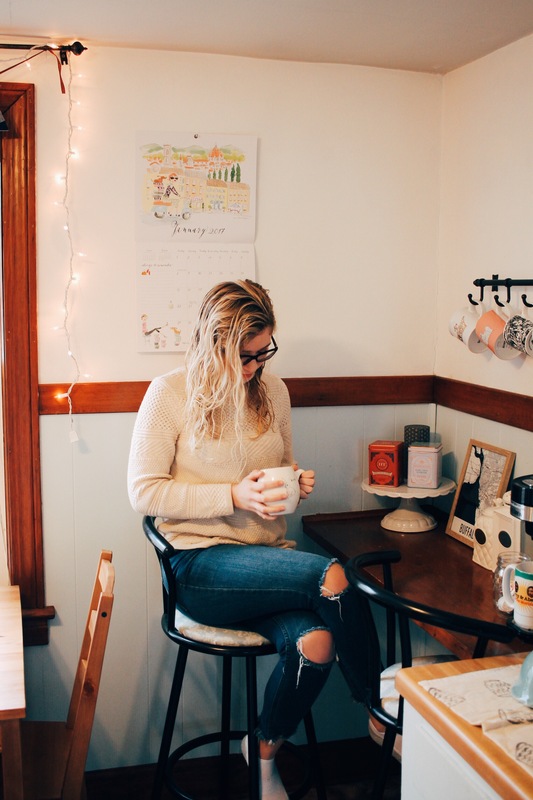 At first I thought you were visiting a local coffee shop, only to learn that it’s a corner in your home! I’m hoping to create a little bar area like this in my basement one day. Looks so cozy and perfect for entertaining! we spend most of our time in our dining and living room because that’s where the tv is, we eat there, our laptops and stuff is there and so on. 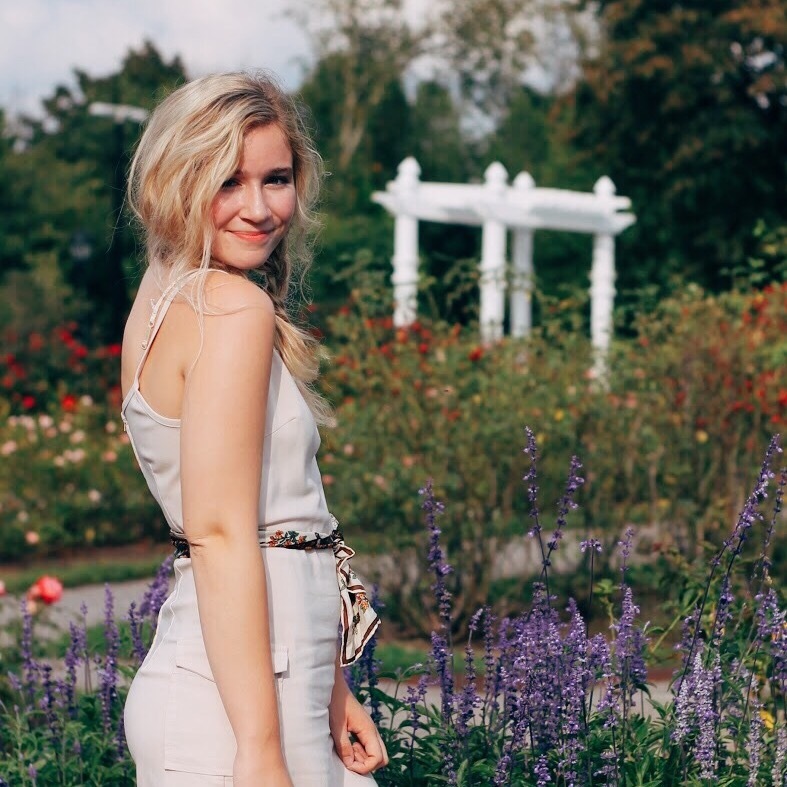 but I also love the warm greenhouse when spring arrives. anyway, your kitchen nook looks really lovely and I can’t believe you found those chairs on the side of the road! and I’m glad you took them because this way you also cleaned that side of the road! not long ago we visited a bog and someone had left some used fireworks there so we gathered it, brought it home and put it in our trashcan. it’s sad how irresponsible people are when it comes to their waste. That bar area looks like a space, I would spend my entire day! 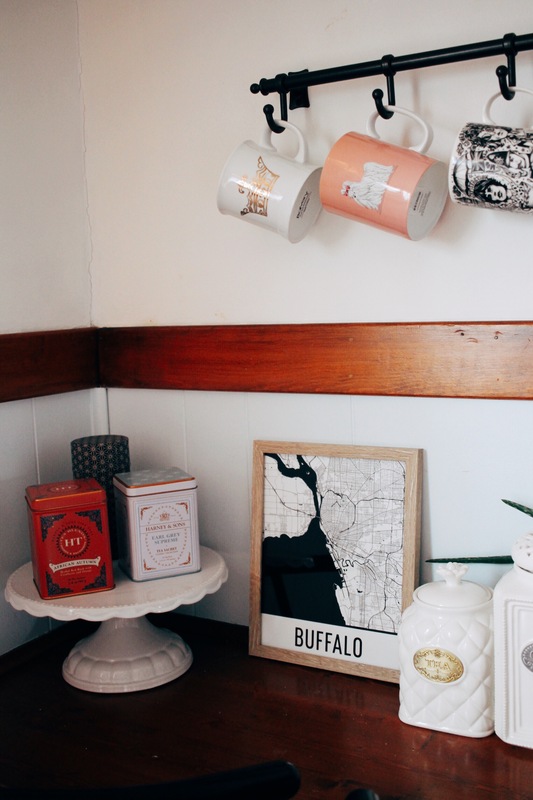 , plus I cannot simply think of any more appropriate place to put that Buffalo print. 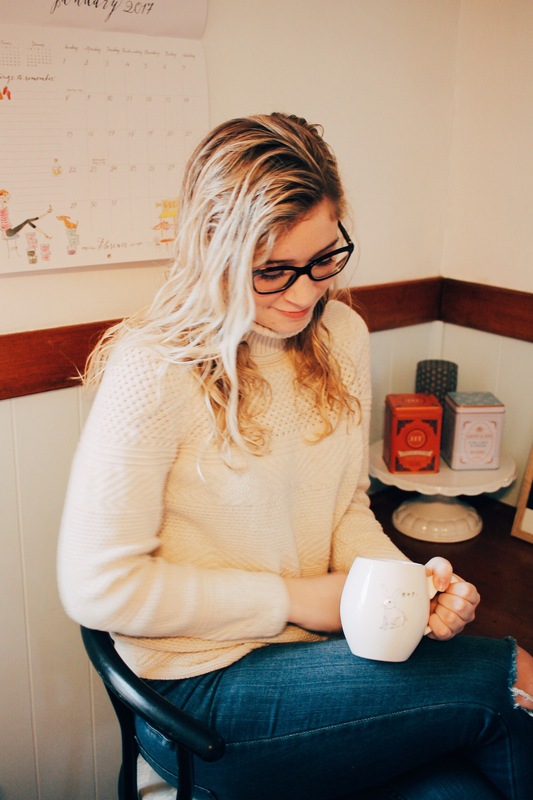 Also, those mugs on the wall look really cute. I really love these kinds of posts as they brighten up my day!. Really amazed with the design and architecture of your kitchen. Your kitchen is just amazing. It’s bright and light. Amazing stuff you got there.